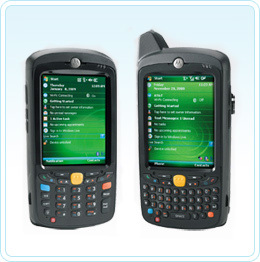 The Motorola MC55 EDA (Executive Digital Assistant) brings a new level of flexibility, functionality and rugged design to size-optimized mobile devices, providing mobile workers with the power to streamline business processes, increase productivity and improve customer service. The smallest and lightest Motorola rugged EDA with a 3.5-inch display, the MC55 packs the power of a cell phone, two-way radio, bar code scanner, digital camera and mobile computer — all into a single device. Designed to meet mobile worker, business application and IT requirements, this easy-to-use and easy-to-carry business-class device offers true consumer styling as well as enterprise manageability, security and scalability. Desktop-like performance with lower power requirements. Increased interoperability with existing enterprise infrastructure; enhanced security features; more flexible development platform; improved mobile messaging collaboration. Cost-effective voice and data connectivity in the office and hot spots. Wireless connectivity to modems, printers, headsets and more; v2.0 provides additional throughput, improved security and additional profiles for expanded connectivity to more device types. Flexibility to use the right mode at the right time. Ability to capture high-quality pictures, documents and signatures as well as 1D and 2D bar codes improves workforce automation, increases productivity and reduces data errors. Easy to view in virtually any lighting. Mitigates battery system failure, bringing a new level of reliability, quality and safety to the entire MC55 system. Flexibility to use numeric, QWERTY, QWERTZ, AZERTY and NAV PIM (5590 only) keyboards allows MC55 to meet diverse user and application needs. Hand-held Warranty The MC55 is warranted against defects in workmanship and materials for a period of 12 months from the date of shipment, provided that the product remains unmodified and is operated under normal and proper conditions. Please click on the button to see the page listing all the Motorola MC55 accessories which includes cradles, chargers, spare batteries, holsters and everything else you could possibly need. There is too much to fit in this section. I've just unpacked my new MC55 and the laser light wont come on to read a barcode. Why? You have to download and install on your PC Datawedge V3.3 (or later). Note: if you install Datawedge and have it running, the camera will no longer work. Disable Datawedge to use the camera. How do I watch youtube videos on the MC55? If I go to youtube.com and try and watch a video I get an error message. Go to www.google.com.au on the MC55 in Internet Explorer and then tap on "More" across the top. On the next screen scroll down to the 'YouTube' link. Tap on that and install the CAB file. Use this instead of Internet Explorer to view YouTube content on the MC-55. Watch a video - click here. How do I warm boot the MC55? Simply hold down the power key for 5 seconds and then let go. The unit should warm boot.